Arrive in Johannesburg where you will be transferred to your hotel. On 2018 departures, you will be trasferred to the Melrose Arch Hotel and on 2019 departures you will be transferred to the Da Vinci Hotel. The Melrose Arch Hotel is located in Johannesburg’s Melrose Arch area with its variety of trendy retail shops and leisure amenities. The 5-star Melrose Arch Hotel is bright and modern with the ultimate in service and technology. The Da Vinci Hotel is a luxury hotel located in Nelson Mandela Square, just steps from many shops and restaurants. The spacious rooms are elegantly decorated and equipped every modern convenience. 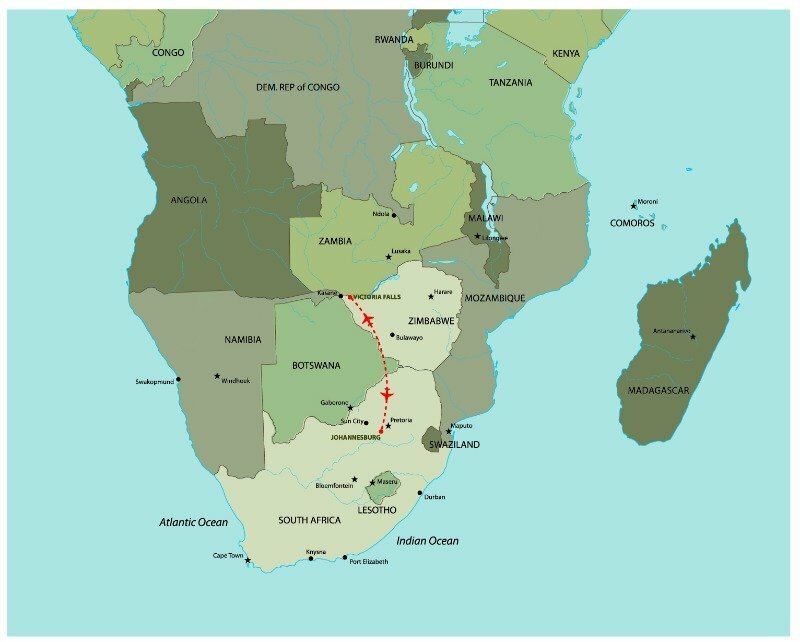 After breakfast this morning you will be transferred from your hotel to Johannesburg Airport for your South African Airways flight to Victoria Falls. Upon arrival you will be transferred to one of three hotels: the Victoria Falls Safari Lodge, Victoria Falls Hotel or The Kingdom at Victoria Falls. The Victoria Falls Safari Lodge is situated within the Zambezi National park, 4km from the falls, with a complimentary shuttle service to the falls. The hotel overlooks a waterhole so be on the look out for wildlife coming to drink. Tonight enjoy dinner at the Makuwa-Kuwa Restaurant at the hotel. The Victoria Falls Hotel was the very first hotel to be built in Victoria Falls. The hotel exudes original colonial Edwardian charm but offers you the modern comforts expected from a luxury hotel. The Kingdom at Victoria Falls is a modern tribute to Africa's ancient allure. Built around a man-made water feature, the 294 bedroom hotel creates an impression of having been built on a lake and is well located in the small resort town of Victoria Falls, just a short walk from the falls themselves. Enjoy dinner at your hotel tonight. After breakfast enjoy a guided walking tour of Victoria Falls, one of seven natural wonders of the world. This tour takes you through the magnificent rain forest where you are able to view the Cataracts, Livingstone's statue and a wide variety of birds and plants. Finish off the afternoon with a tranquil sunset cruise on the Zambezi River. The area of the Zambezi that the cruise is on is one of outstanding natural, scenic beauty with a wide diversity of game and bird life. One has a unique vantage point to spot large animals such as elephants, hippo and crocodiles, as this area lies within Zambezi National Park. After returning to the hotel to freshen up, you will be transferred by road to Victoria Falls Safari Lodge to enjoy dinner at The Boma Restaurant. The award winning Boma restaurant offers a unique African experience that bombards the senses with the tastes, sights, sounds and smells of Africa - coupled with the warmth and hospitality of the local people. Upon arrival in Johannesburg you will connect for your ongoing flight back to the USA on South African Airways. Chobe National Park is the most accessible and frequently visited of Botswana’s wildlife reserves. The Chobe River is most famous for its large herds of elephants which during the dry winter months converge upon the river to drink. 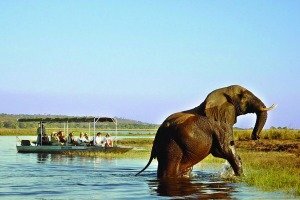 On a Chobe River boat cruise wildlife from a different perspective, where herds of animals converge on – or even in - the water to drink; hippos and crocodiles are right there below you or on the banks and the birdlife is sensational. Open-sided boats provide superb photographic opportunities. Within the park itself wildlife abounds. Aside from the finest opportunity ever to witness the greatest elephant population density in Africa, expect to see antelope species, kudu, roan, sable and impala plus warthog giraffe, monkeys and baboons along with the accompanying predators - lion, leopard, hyena and jackal. Please consult with your Lion World Travel Africa Specialist on accommodations and prices. David Livingstone on seeing the Victoria Falls for the first time in 1855 wrote “Scenes so lovely must have been gazed upon by angels in their flight”. 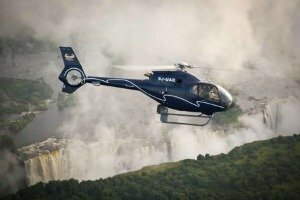 Today the best way to appreciate the true splendour of the Victoria Falls is to view them from the air. On this amazing adventure pilots fly left- and right-hand circuits over The Falls providing unrivalled views and photographic opportunities and putting the full size of The Falls into perspective with the surrounding environment. 2019 internal air arrangements, economy class per person US$715: Johannesburg-Victoria Falls-Johannesburg. Lower airfares may be available when added on to a South African Airways International Airfare. Choose from three luxury accommodation options: The Kingdom at Victoria Falls, Victoria Falls Safari Lodge or Victoria Falls Hotel. Admire the awesome Victoria Falls, one of the Seven Natural Wonders of the World. Mozambique is the perfect honeymoon beach paradise or complement to a Southern African safari.